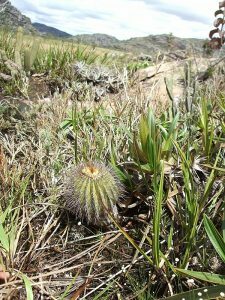 Genus honouring Werner Uebelmann (1921-2014), Swiss nursery gardener and prospector of cacti, especially in Brazil, but also in Paraguay and Uruguay (see picture above, ccourtesy Thomas Uebelmann). A genus of usually solitary plants, rather small, globose to cylindrical (exceptionally up to 1.5 m high), with the epidermis smooth, papillose or waxy, with many ribs sharply defined or tuberculate. Areoles very close, spines fragile and breakable, becoming loose rather easily, sometimes pectinate (U. pectinifera). Flowers diurnal, self sterile, apical or subapical, funnel-shaped, rather small (max. 2.5cm in diameter), yellow, with the pericarpel areoles densely pubescent or woolly, sometimes with bristles or spines, pollinated by bees (pers. obs. 1986). Fruits elongated, like berries, red or yellowish green, dry and dehiscent when ripe. Seeds egg-shaped to spoonshaped (cochleariform), rough to warty, black. Supposed myrmecophilous (by ants) dispersal. The genus Uebelmannia is endemic to Minas Gerais in Brazil, and grows in the mountains of Minas Gerais, on gentle slopes, or highlands, on acid soils, mostly in almost pure white quartz sand, accompanied by plant debris, or in crevices of granite rocks, between 650 m and 1460 m in altitude, together with other cacti (Pilosocereus, Cipocereus), grasses, Velloziaceae, Portulacaceae, orchids and terrestrial bromeliads. The atmospheric humidity is high and the diurnal temperature may hardly reach +13°C in winter. The soil is moderately moist, due to nocturnal mists that rise in the late morning.